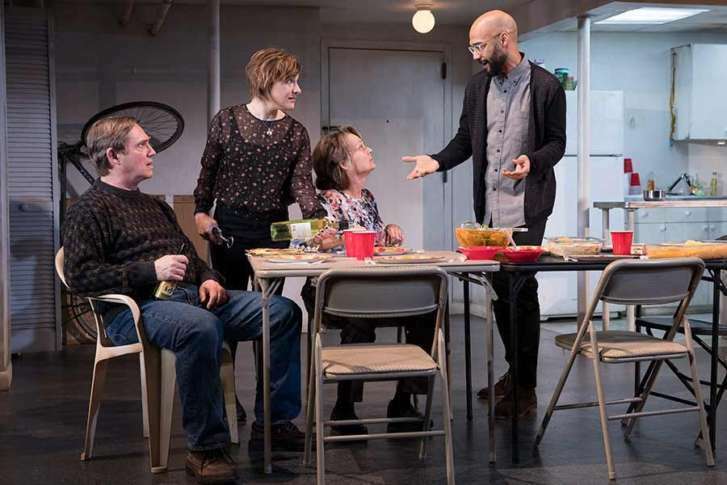 The stage for Joe Mantello’s Broadway touring production of Stephen Karam’s “The Humans”, which I caught at Chicago’s Cadillac Theater Palace where it recently wound up its run, is virtually two stages. It is a shabby NYC duplex in the shadow of where the Twin Towers collapsed, and in a flood zone where Hurricane Sandy recently wreaked havoc, a fact that does not pass unmentioned several times for prickly comic effect. And because the six characters go up and down the spiral staircase from one level to another and back again, it kept reminding me of the British series “Upstairs Downstairs.” Not in any kind of exact way, mind you, but how that British television series sought to examine both the economically prosperous and economically squeezed. In “The Humans”, however, that space between the two has evaporated. Downstairs is a windowless basement pressed up against a noisy laundry room while Upstairs has bars over the window and a noisy upstairs neighbor making an unholy racket. You keep expecting something to crash right through the ceiling. Eventually, essentially, something does. Karam’s dramatic device is age-old yet no less effective – that is, a family Thanksgiving dinner. It does not so much allow for grievances to be aired or even old wounds to be re-opened as ever-present anxieties of the re-convening Blake family to be stoked. They do give thanks, in a ritual involving the smashing of a peppermint pig, though their thanks tend toward the banal, all except for the matriarch, of sorts, Momo (Lauren Klein), though she is terribly ill and out of it, mostly sequestered to a wheelchair, in her last days. Her blessing, however, feels like sunny optimism of a bygone era, about to pass on with her, regarded by her heirs with as much amusement as belief. 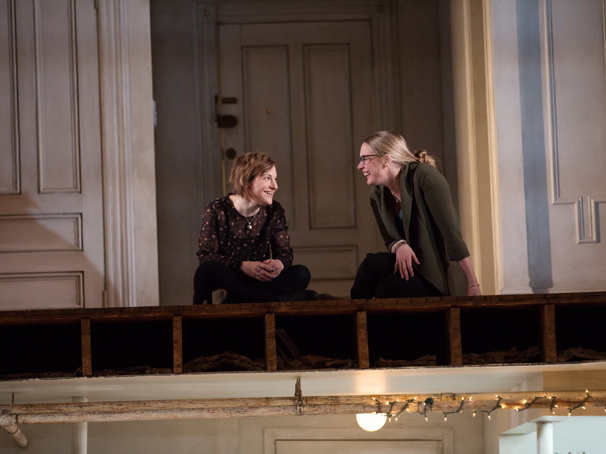 Brigid (Daisy Eagan), hosting dinner for her family along with her boyfriend Richard (Luis Vega), is an aspiring composer riddled by student debt and tending bar, while big sister Aimee (Therese Plaehn) is a lawyer who has been denied partner for taking too much time off in the wake of a health complication, lives suggesting promises that have gone bust. Their parents, meanwhile, Erik (Richard Thomas) and Dierdre (Pamela Reed), financially and occupationally embody the vanishing middle class. If the adage of becoming your parents used to elicit dread for emotional reasons, “The Humans” evokes how modern times have re-fashioned that into a more practical dread, where the term comfortable retirement has become an oxymoron, end-of-life living reduced to nothing more than suffering through omnipresent financial stress. “Don’t you think it should cost less to be alive?” Erik rhetorically asks with a pang that momentarily made me think he was at a Paul Ryan townhall. As Dierdre, Pamela Reed seems to carry the full weight of this burden in her very being, and when her character mentions going back on Weight Watchers, Reed gives it the ring of in advance futility, an inefficacy that might as well connote retirement planning. And Richard Thomas stands at the middle of “The Humans” even if Erik stands just off to the side, sitting at the end of the dinner table with the air of a man who isn’t sure what’s left for him. He occasionally positions himself at that barred upstairs window as if watching guard, trying to play protector, brought home in his constant admonishments of ensuring safety in an un-safe neighborhood. And again and again he implores the importance of family, that when all else fails that is all you have left, except, as we shall see, emblematic of Karam’s screw-turning dialogue, even these battered of bromides are not fit to be buried but to diabolically come back around and bury him. No eternal truth is safe. If the play’s conversation is nearly constant, the clever stage set-up also carves out myriad moments of silence, with Richard spending the play’s opening apart from everyone else on the bottom floor, emblemizing his outsider status, while later in the play characters continually flee upstairs, to use the bathroom, to check the score of the game, as if seeking respite from wearying familial proximity. That we are able to simultaneously hear and see what they are deliberately fleeing makes their respites doubly moving, particularly because conversation often focuses on those out of the room, deftly implying what and why they are escaping, and how it eternally lingers in the air. That silence, however, grows more sinister as the play winds to an unexpected, overwhelming conclusion, one in which the recurring joke of burned out light bulbs ingeniously lays the groundwork for the sensation of the whole world getting smaller, closing in, until it is right on top of them, which is what that repetitive upstairs noise finally comes to symbolize as it stops being funny and seems to almost emblemize some sort of fissure in the Earth opening up to claim Erik. It’s cinematic, almost, risen to a David Lynchian level, in ways that I don’t wish to spoil but also perhaps could not satisfactorily explain to you if I tried. Maybe it’s enough to say I caught myself holding my breath. And as the play ended, I could not help but mentally equate Erik with that most desperate, twitchy of all Springsteen protagonists, the one in a stolen car, riding by night, traveling in fear.